Hi, I'm Andrew VK6IA, I live in Ballajura, locator OF78WD in the northern suburbs of Perth, Western Australia. My other active call is VK6ARA. I also hold a UK licence under the call G5AU. I live with my XYL Eileen and our little yorkshire terrier, Mocha. IcomIC-7800MKII, Kenwood TS-990S, Icom IC-910HX, Icom IC-7000, Kenwood TS130SE and TS530S transceivers. HF Linear amp is an Acom 2000A. My VHF Amplifier is a Mirage B2516G and I use a Microwave Modules MML 432/100 on 432Mhz. I have a GH Engineering Amplifer for 80 Watts on 23cm. I also have an Yaesu FT817ND for portable operation with a Miracle whip and wire antennas when traveling for work. I am active on 80M to 23cm all modes including SSB, CW and digital modes. 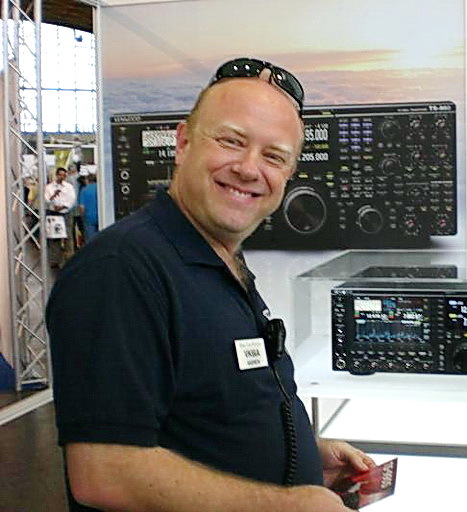 Mainly I enjoy DXing looking for "new ones" and working DXpeditions. 20-6M 3 element SteppIR yagi with 6m passive element at 15m. Butternut HF6V 6 band Vertical 80-10M mounted on Large Peaked metal roof which serves as an effective elevated radial system. Diamond X7000 2/70/23 colinear for V/U/SHF FM on the top of the tower. Cushcraft 10 Elements on 144Mhz SSB, M2 12 Elements on 70cm SSB and M2 22 Elements on 23cm SSB. My Antenna pics and other news can be viewed at my blogsite.